There are countless Hermès leathers, but there is only one Hermès. Below is a comprehensive guide of all the currently known leathers and skins. We will be updating seasonally as new Hermès leathers are introduced. We have separated this guide in three: 1. 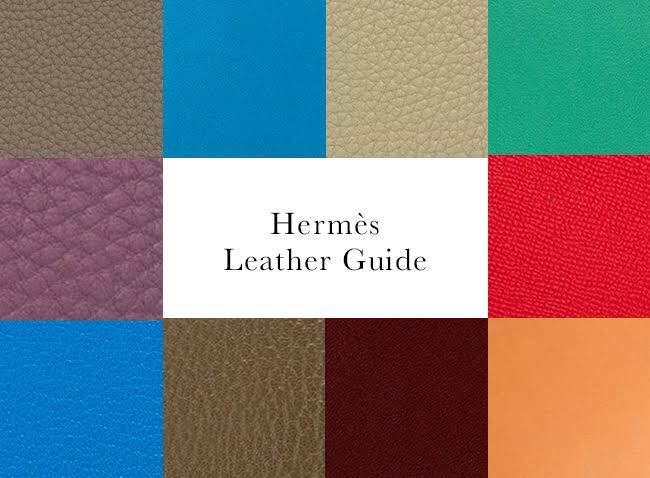 The Top 10 Most Popular Hermès Leathers, followed by 2. Hermès Exotic Skins and 3. Other Leathers. Madison Avenue Couture is your go-to destination for your authentic ultra-luxury items, including Hermès, Chanel and Louis Vuitton. With its smooth finish, water-resistant qualities and beautiful neutral shade, it is no wonder this leather was first used by Hermès to create saddles. Because it absorbs the oils found on skin, Barenia leather creates a patina over time, which depending on the owner’s preference, can be a drawback or an advantage. Box Calf, also known as Veau Leather is Hermès’ oldest leather used in handbags. It is a fine-grain leather that develops a beautiful patina over time. 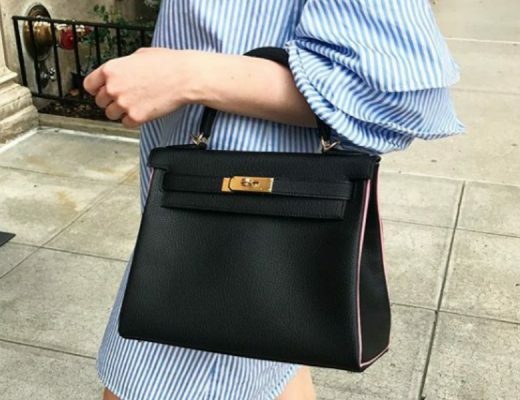 Because of its sturdy nature, Box Calf is most commonly used in bags that hold their shape well, like Kelly Sellier bags. Box Calf is a delicate leather, prone to scuffs and scratches and if wet, can develop blisters. However, some of these marks can be minimized when taken to an expert for reconditioning, or to the Hermès spa. Chèvre de Coromandel one of the most coveted Hermès leathers. It’s sourced from male mountain goats, which gives the leather a resilience that differentiates it from others offered by Hermès. It is distinguished by its iridescence and slight graining. The toughness of the leather and the fact that it is textured makes it almost impervious to scratches and other blemishes—even though the leather per se is lightweight and soft to the touch. Because of all these prodigious qualities, Chèvre de Coromandel is a more expensive option in Hermès’ spectrum of leathers. Another one of Hermès leathers made from goat hide, Chèvre Mysore is a more refined version of Chèvre de Coromandel with a larger grain, but sharing the same characteristics: lightweight and scratch resistant. Epsom is one of the most popular materials in the Hermès leathers roster. The leather is embossed into a natural-looking pattern, giving the surface a laminated appearance. An Epsom leather bag holds its shape over time. Along with being durable, the embossed surface allows it to be waterproof, and far less likely to show scratches. The leather is also lightweight and easy to clean, requiring just a simple swipe of a moist cloth. Essentially, it is a great choice for frequent travelers or those that may not be so protective with their handbags throughout the day. Fjord has a flat, wide grain (much like Togo and Clemence leathers), and it is renowned for having an elegant matte appearance. Though the texture is supple with a velvet-like finish, the leather is rather heavy and completely waterproof. From a distance, Fjord handbags look like they have “veins” throughout. Fjord is often used for large bags, as the skin in hardwearing and is able to withstand trying weather conditions. The leather formerly known as Guilliver was discontinued in 1999, but reintroduced in 2005 under a new name: Swift. Swift leather’s fine grain is soft to the touch and absorbs colors beautifully, making it a great option for Hermès color lovers. Also known was Veau Taurillon Clemence, or simply TC, Hermès Taurillon Clemence leather was first introduced in the 1980s. It has a matte and smooth, even-grained surface that is used in slouchier handbags, like the coveted Birkin. Although durable, this popular leather is delicate, developing blisters if wet, as well as cracks along the edge if not properly moisturized by an expert. Veau Tadelakt is one of Hermès most popular leathers, though it is often confused with Box Calf because of the many similarities they share. Both are known for their smooth and glossy finish, which is why they are susceptible to scratches and can blister when exposed to water. But even with these drawbacks, Tadelakt is still in demand for its silky texture. Indeed, it is much more lustrous than the Box Calf—primarily because it has no visible grains. Another one of the most popular Hermès leathers is Togo. Introduced in 1997, Togo is the perfect leather from when you’re looking for a leather that’s easy to maintain. This type of leather is well suited for larger bags, as it is able to hold more weight. Because Togo is a grained leather with visibly pronounced veining, it is less likely to show scratches. This is one leather that can be made to look brand new after a visit to the Hermès spa, even after prolonged use. From Mississippi Alligator, this is a highly sought-after exotic skin available in both matte and shiny (lisse) presentation. This delicate skin is rarely found in larger handbags and although similar to crocodile, alligator handbags are less expensive. You can recognize alligator handbags and accessories by the square marking next to the Hermès name. The popular crocodile comes in two presentations: shiny and matte. The former is achieved by buffing the skin until it develops a beautiful shine. Compared to alligator, crocodile handbags have larger scales and small dots or pores in the middle of the scales. 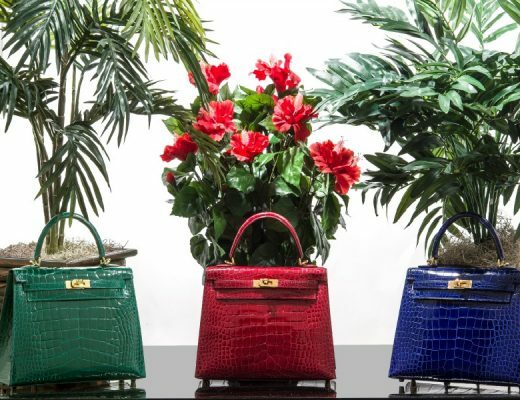 Crocodile handbags can be recognized by the two dots signs (••) next to her Hermès name. Although the crocodiles are sourced from the Nile river, it is recommended the bags stay away from water, so as to avoid damaging them. Crocodile Porosus is the most expensive exotic skin produced by Hermès. Just like its Niloticus counterpart, Hermès’ Crocodile Porosus can be shiny or matte. Sourced from Asia or Australia, this popular exotic skin can be recognized by a ^ symbol. Like most of Hermès exotic skins, Lizard comes in both matte and shinny presentations. However, the small lizard scales give even the matte items a slightly shiny appearance. Because of the size of lizards, it is usual to see this type of skin in smaller accessories and handbags. Lizard is a delicate material that requires frequent visits to the spa, to avoid drying of the scales. Hermès Natural Lizard was first introduced in 2007 and is a rare find, making it very popular among Hermès collectors. It is usually used in combination with other leathers and skins. Ostrich is one of Hermès most durable exotic skins. It holds it shape well over time, it doesn’t tarnish if wet, and has the beautiful quality of darkening or lightening when in contact with human skin and light. No longer in production, Amazonia could be mistaken for another one of Hermès leathers, but it is actually rubber-coated canvas, making it 100% water-resistant, though still capable of scratching. Also known as Vachette Garinee des Ardennes, this is one of Hermès’ toughest leathers, perfect for bags that are used often, as it is both water and scratch resistant. The processed, thick grained-leather holds its shape well but the colored dyes can fade with time. Ardennes is no longer produced by Hermès, but Vache Liegee leather is a good alternative. Named after Hermès iconic Paris boutique at Rue de Faubourg Saint-Honoré, this new 2017 leather has a small grain, unlike the original Barenia, making it more resistant to scratches and blemishes. Buffalo leather is fairly soft and supple. It is known for being remarkably malleable while also being durable, which means that it can withstand a variety of wearisome environments and activities. Scratches and tears are nearly unlikely to happen, and the strong fibers also make it flame resistant—qualities that have made Buffalo leather perfect for Hermès’ Garden Party line. The surface of Buffalo leather has a grainy texture, yet is still relatively smooth to the touch, making it easy to clean with a few swipes. It is also known for developing unique coloring as it ages, becoming even more visually striking over time. That said, Buffalo leather isn’t without caveats. First, it requires yearly conditioning so as it keeps its shape. And because it is made from individual animals, finding another leather to match can be hard. This discontinued leather has a peculiar, veiny appearance, as it has been dyed twice, and during the dying process, pigments gather toward the center of the grain, giving it its unique spotted look, similar to a Dalmatian dog. Also known as Buffalo Skipper, Buffalo Dalmatian is resistant to scratches and water; flexible, and durable with raised, medium-sized texture and is available in the secondary market in a few different colors. This soft leather is only used on smaller marroquinerie and it’s recognizable thanks to its sophisticated grain that can seem to glisten under direct light. Buffalo Sindhu was first introduced in 2007 and only used in the Green Party line. It is a heavy leather that won’t show scratches or blemishes, making it perfect for those who use their Hermès bags often. Introduced in 2013, Butler is another one of Hermès leather that i natural and untreated. It’s a leather that requires the utmost care as it shows scratches easily, though most marks can be buffed out. This is a rare and hard-to-find leather that has been compared to the more popular Barenia leather that also develops a patina over time. Chamonix leather is sourced from male calves from a resort area in French Alps called Chamonix—hence the name. The matte version of Box Calf leather, Chamonix has a smooth, almost plastic-like texture to the touch. Compared to Box Calf, Chamonix is more durable and doesn’t have the same susceptibility to scratches. However, it is extremely sensitive to water and can blister overtime when left in a moist setting and/or not taken care of properly. If it were to get wet, Chamonix leather must be wiped down immediately with a dry cloth so as to preserve its condition. Hermès Country leather was introduced in 2012. Its large grain, firmness and durability make it a great option for Garden Party handbags. Courchevel leather is embossed and lightweight —qualities that often prompts comparisons to the more popular Epsom leather. Because of their slightly textured exterior, both are easy to clean, water-resistant and are less prone to scratches and other abrasions. However, the pigment on the top grain of Courchevel leather is much darker toward the center, making it appear more lustrous. This trait, combined with its fairly smooth surface, is why Hermès has used it for a variety of smaller accessories, from wallets to key chains. And though the brand prefers to use Epsom as of late, there are still items made from Courchevel in the secondary market. Crinoline is made from horse hair and hemp, and just like canvas, is often used in conjunction with other leathers. Although discontinued, bags in this material are still available in the secondary market. Because of Crinoline’s durable and sturdy nature make it a great option for handbags that need to hold their shape, such as Jige Clutches. Derma leather first made its appearance in 2004. Smooth to the touch and delicate, this is another one of Hermès leathers made from male calf. Also known as Grizzly, is regular suede, and just like any other type of suede, it must be kept away from water, although some scratches can be buffed. Evercalf is very similar to Box Calf. Indeed, at first glance, these two types of leathers are almost interchangeable. In regards to tactility, though, Evercalf is much softer and smoother. It also has a more matte surface with just a hint of sheen. Additionally, it is not as prone to scuffs and scrapes, making it a more sturdy option for everyday use. Hermès’ Evercolor was introduced in 2013. It is a firm leather with a matte appearance, and it’s most commonly used in small leather goods. Evergrain is the sister leather of Evercalf. The major difference between the two is that Evergrain is embossed with a crackled motif, which makes it even softer. Because of this, the leather is vulnerable to scratches when not taken care of properly—even more so than other embossed styles. However, small marks can be buffed out, but larger scuffs need to be taken to a professional for refurbishing. Feutre is a soft and warm wool material, most commonly used, though not exclusively, in smaller accessories. Hermès’ Grain d’H Calfskin leather, with its signature H monogram, first made its appearance in 2012. The small grain is soft, yet its texture protects against blemishes. This leather has been used a lot in both handbags and smaller accessories. Veau Grain Lisse, commonly known as VGL, is one of many Hermès leathers that is pressed and processed, giving it a thin and glossy appearance. Because it shares many qualities with Epsom leather, Veau Grain Lisse was discontinued by Hermès in 2003. However, you can still find a pre-owned VGL handbags in the secondary market, which would be resistant to scratches and water, and easy to clean. Herringbone is the name Hermès gives to their durable linen woven into a chevron pattern with two color threads. Introduced in 2006, this wool materials with a plaid print was exclusively used in the Fall Paris collection and has since been discontinued. The lambskin leather of choice for small Hermès leather goods, such as Rodeo charms. Hermès Negonda leather first appeared in 2007. Its large grain makes this leather completely resistant to water, making it a great option for large bags that are used often, such as the Garden Party. Peau Porck is a lightweight and durable pigskin leather. Although discontinued, Peau Porc can still be found in the secondary market, and just like with many other Hermès leathers, must be kept away from water as it can tarnish. Hermès has utilized Shearling in coats and other winter accessories, but Shearling bags are extremely rare to find! Only a handful or Kelly Retourne Shearling bags have been produced by Hermès, making these a coveted item amongst Hermès collectors. First introduced in 2011, this smooth and delicate calf leather has a matte finish and soft texture and could scratch easily. Sombrero is a study leather that is sometimes used in rigid handbags, such as the Kelly Sellier or the Constance. This type of leather is mostly found in men’s maroquinerie and bags. It’s soft to the touch and has visible grains. Made by combining two different colors threads to form an “H”, Toile Canvas is usually combined with other leathers. Canvas is one of Hermès most durable materials, which is additionally fairly easy to clean by an expert. Don’t try cleaning it at home. Another one of Hermès’ canvas but with a larger weave than Hermès regular Toile canvas, hence its name GM, or Grand Modèle. Toile Officier is a cotton canvas that uses a thin thread of a single color. It is most commonly seen in the Garden Party and the Herbag lines. This special and eye-catching material is a combination of canvas and wool, woven together to create an “H” design. Only used on Garden Party handbags, Toile So H is very light and durable. Another of Hermès cotton canvas. Toile Jean is denim canvas, which just as denim, is casual and quite durable. Cotton canvas woven in the shape of chevrons. Not to be confused with Herringbone Linen, Toile Chevrons is made with two threads: one dyed and one left natural. This is a flexible and durable material. Troika is a very special and hard to find leather, covered in calf hair, giving it a very distinct texture. Hermès’ Vache leather has not been treated and has been left in its natural state, so you can expect a patina to form after multiple uses. This type of leather is delicate and soft and just like a good wine, gets better with time. This is an old leather, commonly found in vintage handbags. It’s only released in two colors, Natural (pictured) and black. A stiff-yet-delicate leather, Vache Hunter is most commonly used to trim handbags, like the Herbag, but can also be find in other Hermès bags, like the Evelyne. Vache Liegee first made its appearance in 2004 to replace Ardennes leather. It is Hermès’ thickest leather, which makes any bag made with this leather hold its shape very well. Another one of Hermès leather that is quite rare. Sturdy Vache Trekking was first introduced in 2009 and is only seldom used by Hermès handbag artisans. Veau Rodeo, or simply Rodeo, is instantly recognizable because of its veining. This durable leather is 100% resistant to scratches and is often used in accessories that are worn often, like wallets. Sikkim leather is similar to Swift but even lighter and thinner, making it prone to scratches if not properly cared for. Also known as Nubuck, is mostly used in smaller accessories, though it can be found in some handbags, making them very precious and delicate. It may look like canvas or fabric at first sight, but Vibrato is actually made of strips of goatskin leather and suede. This rare and eye-catching style is resistant to scratches and a bit more expensive than other Hermès leathers.